Your satisfaction is very important to us. Lots of companies claim to be green. But how can you tell which ones are really reducing their impact on our health and the environment? Look for the Green Seal. Offering a healthier alternative to cleaning carpets, the cleaning solutions we use are plant derived, 100% biodegradable and non-toxic. 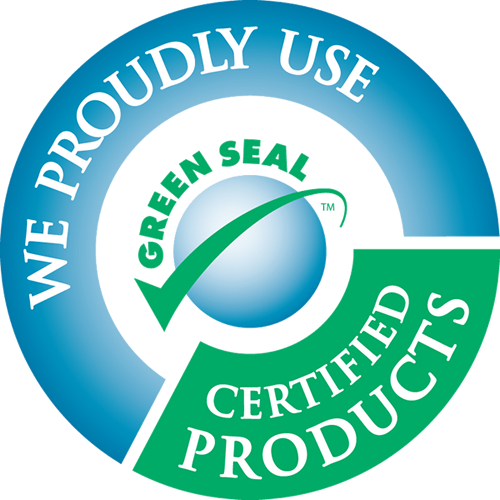 Many of the cleaning solutions we utilize are Green Seal Certified. Green Seal is an independent, non-profit organization that promotes the manufacture, purchase and use of environmentally responsible green cleaning products and services. These all natural products are not only healthier, but they also do an excellent job at removing soil and allergens from your carpets. We use a unique low moisture, Earth friendly method that leaves carpets clean and dry within a few hours, not days. By greatly reducing the drying time reappearing spots are virtually eliminated and mold, mildew, bacteria, have less of a chance to grow in a dry environment. Carpets stay cleaner longer because the “all natural” cleaning solutions don’t leave a soil-attracting residue behind. EcoGreen has done a great job cleaning the carpet in our home. I would highly recommend them to anyone needing their carpet cleaned.